The fourth NanoShow will be on Tuesday, February 12, at 1700 GMT, 9am Second Life time (Pacific Time). Dr. JT Janssen will give a talk titled “Nano-Science and the Quantum World.” To find out how to attend, and to read the full abstract of the talk, visit the NanoShow webpage. The third NanoShow will be on Tuesday, January 29, at 1700 GMT, 9am Second Life time (Pacific Time). Prof. Leslie Pendrill will give a talk titled “Supporting Growth in Nanoproduction.” To find out how to attend, and to read the full abstract of the January 29 talk, visit the NanoShow webpage. On Tuesday, 11 December, 18 December (rescheduled), Kamal Hossain, NPL’s Director of Research, will give the first in a series of seminars in Second Life that we’re calling The NanoShow. The title of his talk will be, “Nanotechnologies: Opportunities and Threats” This interactive event will be a first for NPL. To find out more and how to be involved, click here. This article is a re-post of an article from my knowledgecast blog. I think its a good example of how to communicate science using Second Life. And the science is really cool too. I recently told Vlad Sokhan, a Strategic Research Fellow in molecular modelling at NPL about Amazon’s amazing new hardware-on-demand service, called Elastic Compute Cloud (EC2), that I’d heard about from Jeff Barr’s speech at a recent conference in Brighton (I listened to the podcast as the conference was full!). Vlad needs computing power for his molecular modelling work and currently uses the NPL grid. He showed me a short movie segment that had taken over 30 hours of PC time to render. The movie showed methane molecules flowing through a carbon nanotube and had led Vlad to discover a kind of super-flow, which was 100 times faster than expected. In view of these and other amazing properties carbon nanotubes are expected to underpin future developments such as new energy sources and miniature chemical factories that could help remove greenhouse gases from power station emissions. Within the space of an evening Troy McLuhan and I had finished an exhibit of a 3D carbon nanotube and the movie with an explanatory information card. It took rather longer to decide where to place it at the new Science Center on Info Island. Here’s a picture of the final exhibit which was there for the Science Center opening meeting on October 12th 2006. Here comes the science: Carbon nanotubes continue to amaze scientists with their unique and unusual properties. How does the super-flow work you ask. Well, traditional models of fluid flow do not work well with nanotubes since they either use a fixed volume of fluid containing a changing population of particles or a continuous flow that is slower near the edges. Vlad’s approach accurately models the molecules behaviour as they encounter the inside surface of the nanotube. For a variety of reasons they actually speed up and travel further and faster along the tube walls than previously thought, and spend longer close to the walls instead of bouncing back into the main flow. Endnote by Troy: Since the above blog posting first appeared, the Science Center moved from ‘Info Island II’ to ‘Infotainment Island’. 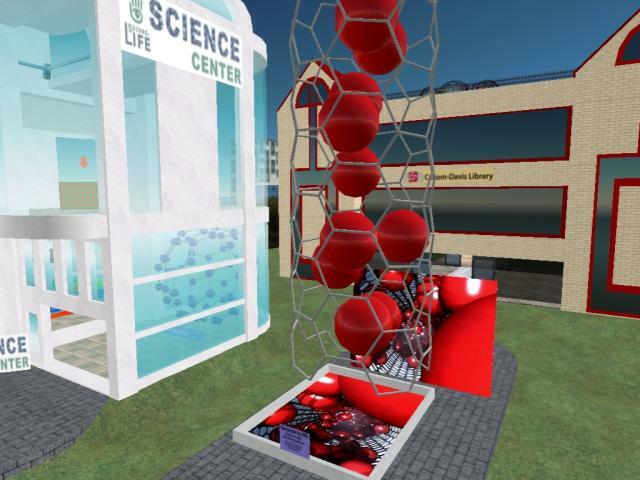 The exhibit showing the flow of methane through a nanotube was taken down (as were all exhibits) and was rebuilt on the SciLands sim (just north of the Nanotechnology sim). You can visit it by clicking here.